We had a tough time last week getting the lids shut on our boxes, particularly the large shares. Despite the ongoing war with rabbits and squirrels, our gardens are offering bumper crops of lots of different items; with thousands of row feet of tomatoes coming soon! We really weren't expecting the baby kale-dominated braising mix to be still going strong in the middle of summer, but there it is; looking great. The basil looks succulent this week, and we're proud to offer large box subscribers our carefully tended Arugula. Well, not a a partridge, and not a pear tree. 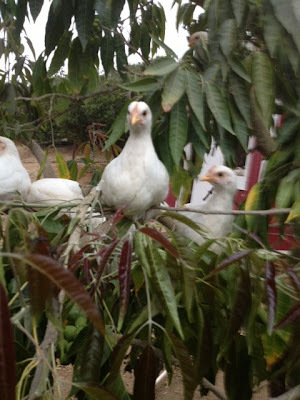 Peering out at the photographer: our not-as-stealth-as-they-think-they-are juvenile hens roosting in their new favorite tree: a sapote. They're not laying eggs yet, but have finally taken to launching into the trees at night to guard against predator attacks. Baby chicks don't roost, so we know we're halfway to eggs when a young hen starts to fly at night.